Unfortunately I can’t capture an entire speech in a simple layout like this. My explanations for each slide are a bit oversimplified. If you have questions or comments, or would like us to do a deeper dive into any one of these points, please drop a comment. The core concept is that we’re trying to help parents make the best decisions for themselves and their children. (Adult immunization is part of this conversation too, but understandably the kids take up most of the attention.) You can’t do it by arguing with someone. When was the last time someone changed your mind about something that mattered to you by being argumentative? Could someone badger you into changing political parties? People change their own minds. Conversations like this support that change and help parents make it with the best information. I’m not a nurse or doctor or any kind of healthcare professional. My expertise is in negotiation, communication, and persuasion. The Summit included some truly excellent work on health care providers’ conversations with parents; I focused instead on the conversations parents have with laypeople. In other words, the conversation two parents might have at the playground, which is very different from the conversation they’ll have in their doctors’ offices (and possibly more significant in the long run). People usually get involved in a conversation like this to say what they want to say, as opposed to saying what’s most effective. For example, I sometimes chide people on Twitter for misrepresenting the science of vaccine safety because I want to refute their nonsense, even though I’m aware that directly confronting their mistake not only won’t change their mind but might make them dig in and solidify their beliefs. Is that a mistake? It depends on what the goal is. 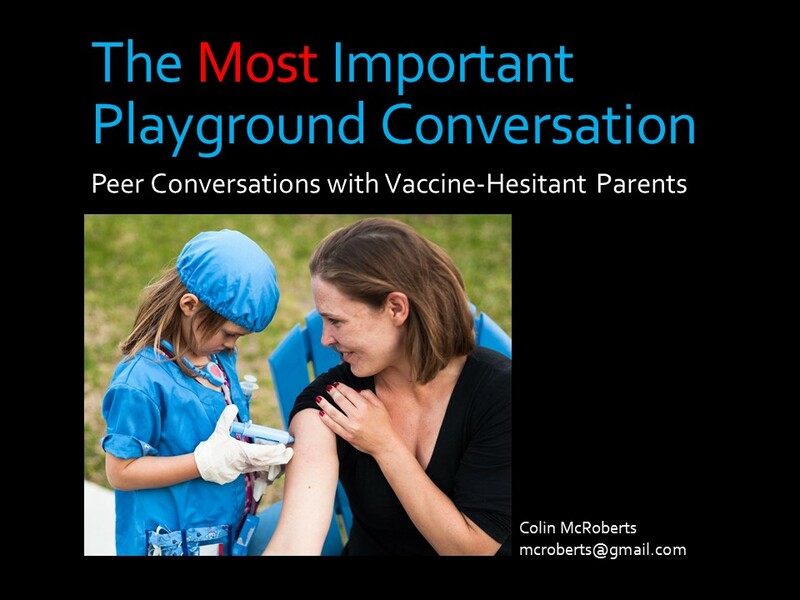 The metric for whether a conversation works is whether it accomplishes the ultimate goal: does it result in more or fewer kids being protected against vaccine-preventable disease? Does it build up the relationship between the people talking? If either answer is “no,” then you need to rethink your approach, even if you’re just burning to denounce someone for not vaccinating. The point isn’t to be the bravest, strongest, or smartest person in the conversation–it’s to protect more kids. The playground conversation is a kind of peer communication, between people who think of each other as belonging to the same social group. 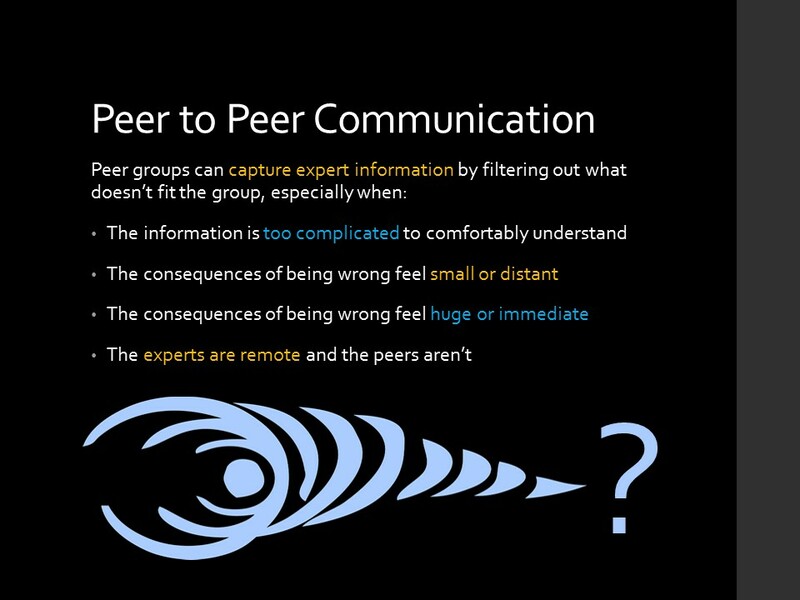 Peer communication is incredibly important, but it’s so pervasive that it becomes invisible sometimes. People tend to forget how much it shapes opinions and behavior. Why do kids want to smoke and drink? It’s not because they like the smell and taste. It’s because they think it’s cool. And they think it’s cool because their peers tell them it is, and their peers think it’s cool because their peers tell them it is, and so on. That kind of subtle, soft peer pressure doesn’t stop when you grow up. It influences what you wear, what you eat, who you listen to and who you trust. 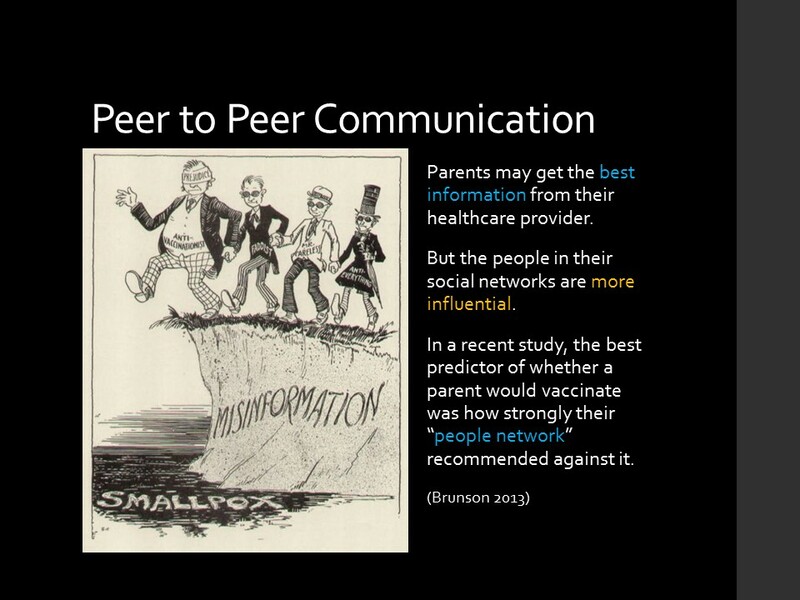 Pediatricians at the Summit related anecdotes showing how important peer communication is. One talked about a patient who received Dr. Sears’ anti-vaccine manual as a baby shower gift. Another said she has had parents come in to ask her to use the vaccination schedule they got from their friends. Think about what that means: someone asked her doctor to administer medication not on the schedule recommended by the experts, but according to a plan she read on Facebook. Would she do that if the medicine were an antibiotic or blood thinner? Probably not, because her peer group isn’t urging her to resist the application of antibiotics. 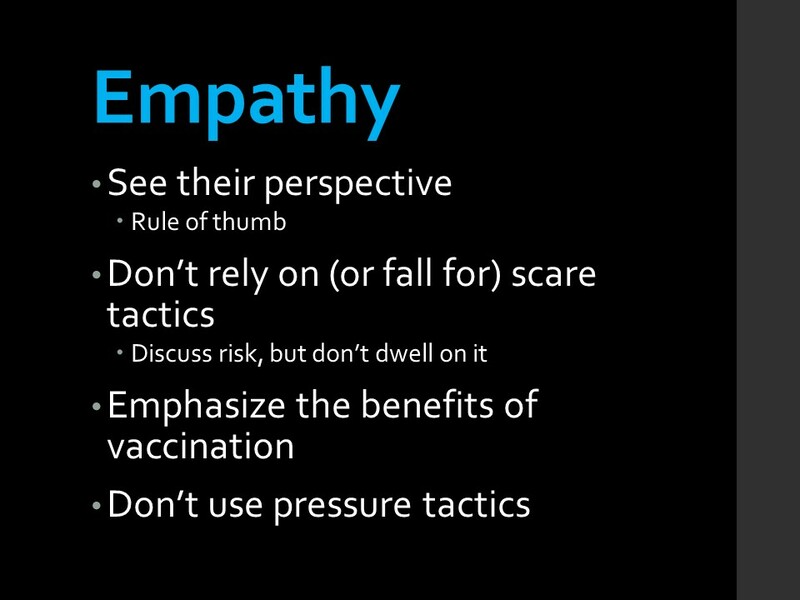 But once her peer group internalizes an anti-vaccine narrative, she’s much more comfortable ignoring actual knowledge in favor of what the group thinks is best. If you asked her she’d probably agree the group doesn’t know as much about vaccination as her doctor, but her peers are more present and significant than the pediatrician she sees once in a while. That can make their opinions feel more significant, and harder to ignore. Obviously every parent wants what’s best for their own kids. But most parents can’t really know what that is, since it requires expert knowledge and access to tremendous amounts of data to personally compare the risks and reward of vaccination. Instead most people have to go by what feels like the best choice. And while the doctor may have the best information, peer groups are more immediate and present in everyone’s life. Louder voices are easier to hear and easier to remember. A graphic like this steals attention from whatever else is being said, just like a strident voice takes up all the oxygen in a room. That doesn’t mean that parents will necessarily believe the extremist voices in their lives, of course. They don’t have to be taken completely seriously to be dangerous. An extremist voice sets one end of the range of beliefs we see in our peer group, implicitly making all the beliefs that fall between that radical position and my own feel more credible to me. So for example, someone who has a dear friend telling him that vaccines are poison concocted by the New World Order to sterilize the masses may not buy that particular story, but find it more credible that vaccines are dangerous simply because they’ve been strongly exposed to a more extreme position. We typically want our beliefs to fall fairly close to the beliefs of our peers, so outliers that distort that perception can have a large impact. If what we think our peers believe influences our own beliefs, then the most important part of the conversation is obvious: just show up in it. (Hat tip to commenter Ben S who made this point in the last post.) The fact is, most parents vaccinate. And parents need to know that most parents vaccinate. Knowing that helps show parents that most of their peers do protect their children from preventable diseases, even if the outlying voices are shriller. But the very fact that those voices are so strident makes it easier to focus on them that that larger, quieter majority. So don’t be silent. 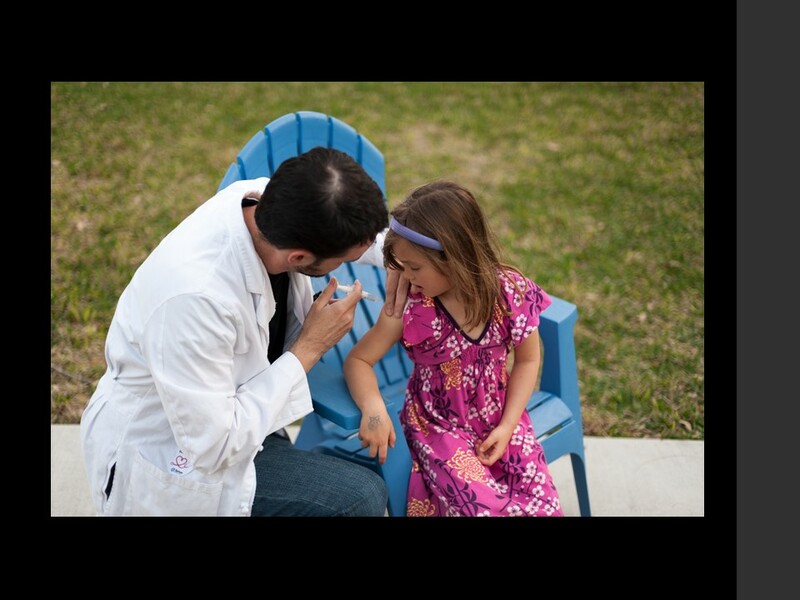 Speak up, and let your peers know that you vaccinate and that you do it to protect your children. If you don’t have children, tell them that you vaccinate yourself. There are two goals here. The first is just to give the other person a more accurate impression of what their peer group does and why they do it. The other is to show that vaccines aren’t frightening or hard to talk about. People vaccinate to protect themselves and their kids, just the same way they’d use antibiotics or painkillers. Talking about vaccines like just another sort of proven medicine helps put the anti-vax figures in context: as radical, fringe voices that have been blown out of proportion by the media. There are a lot more than four things to consider, but I like simple frameworks. They’re easier to apply in the real world, since inside a tricky conversation (or planning for one) you’ve got a lot more to think about than just your basic guidelines. In other words, these are starting points and shouldn’t constrain you from thinking in new directions. Honesty is crucial. Personally, I think it’s best to come right out at some point in the conversation and acknowledge that you’re trying to persuade the other person to vaccinate. Someone who thinks you have hidden motives has a very powerful, and very good, reason not to trust you. Your motives shouldn’t be hidden, because all you want is to persuade them to make a safer, more responsible choice to protect their kids. How credible is that person now? How persuasive, to anyone who didn’t already see pro-vaccine advocates as blood-soaked maniacs? That belligerence immediately ended a chance for greater communication and persuasion. In contrast, another vaccine-hesitant parent in the same conversation accepted the idea that we’re all in it for the health of everyone. More importantly, I accepted that she has the same goal, although we argued about many other things. Our mutual willingness to see each other as fundamentally decent human beings made each of us more likely to listen and take each other seriously. Neither should you fake knowledge. Many anti-vax advocates are well educated in narrow talking points, and may have technical questions you can’t answer. That’s OK–you don’t have to. The weight of the science is not on your shoulders. Admit to the limitations in your knowledge. If you want to be more aggressive, you might ask questions that will show the limits to their knowledge too. “How many parts per million of mercury did you say are in that shot? How do you know? Is that the same kind of mercury that is in a thermometer? How do you know? If it’s not, what’s the difference?” That assumes, as we’ll get into in a second, that the other side is willing to let you ask questions. Finally, there’s a time and a place for these conversations. Make it face-to-face whenever possible. 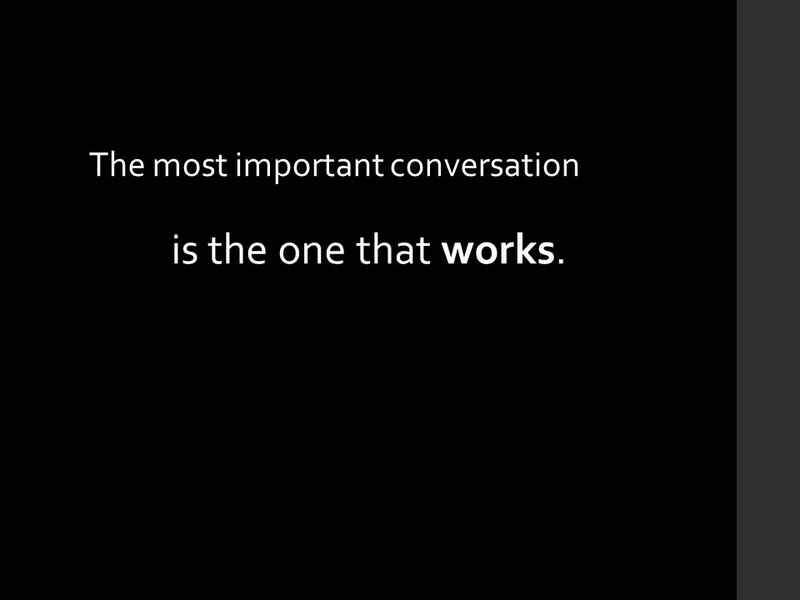 Personal, physical conversations have more bandwidth because they permit a lot of non-verbal communication. 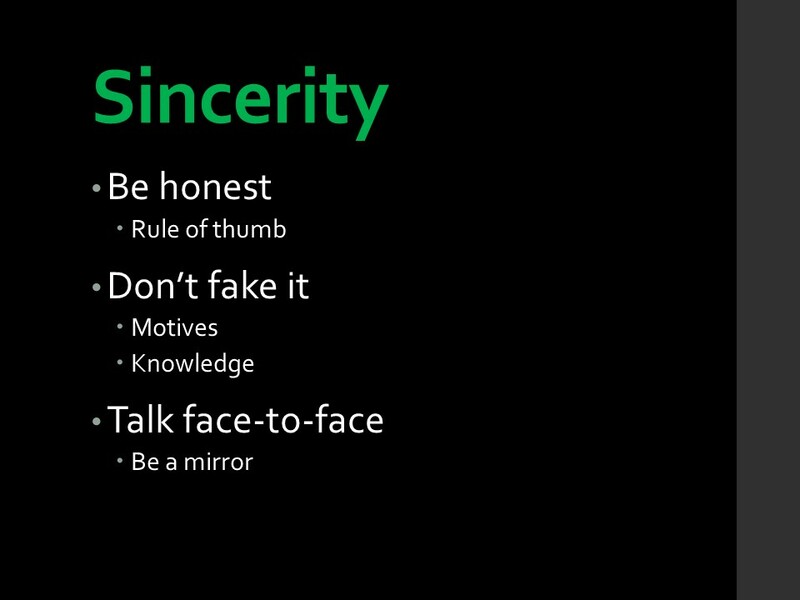 And it’s easier to remember what you’re told in person, making it more persuasive. The first point is the most important, to reiterate what we said before. The other side isn’t stupid or crazy or malicious. Even if they were, you should go into the conversation assuming otherwise. If the other side picks up on the fact that you think she is a monster, she’s going to discredit what you have to say before you ever open your mouth. Don’t rely on scary anecdotes, argue, or apply pressure tactics. These things don’t just fail, they are counterproductive. Someone who feels like their important beliefs are under attack (and by the time someone has decided not to vaccinate, their opinions on vaccines are very important to them) will often dig in and get defensive. They become more attached to those beliefs and harder to persuade. Here’s an example of a pressure tactic that fails. Does this make you seriously question the safety of vaccines, or make you want to go convince some more people to vaccinate just to shove it in the face of whoever made this? This is a parody image, not a real anti-vax campaign. An artist made it because they knew it would make Natural News look horrible. The parody works because this kind of high-pressure tactic is so obviously flawed–and yet people on both sides of the issue use them all the time. And here’s an example of a positive persuasion approach. This image conveys the sort of positive elements we’re looking for: the little girl looks like she feels safe and at ease, the environment is comfortable, and while the needle is at the center of the image its the people who draw the eye. This is an attempt to convey a sense of peace and security, not fear and loathing. 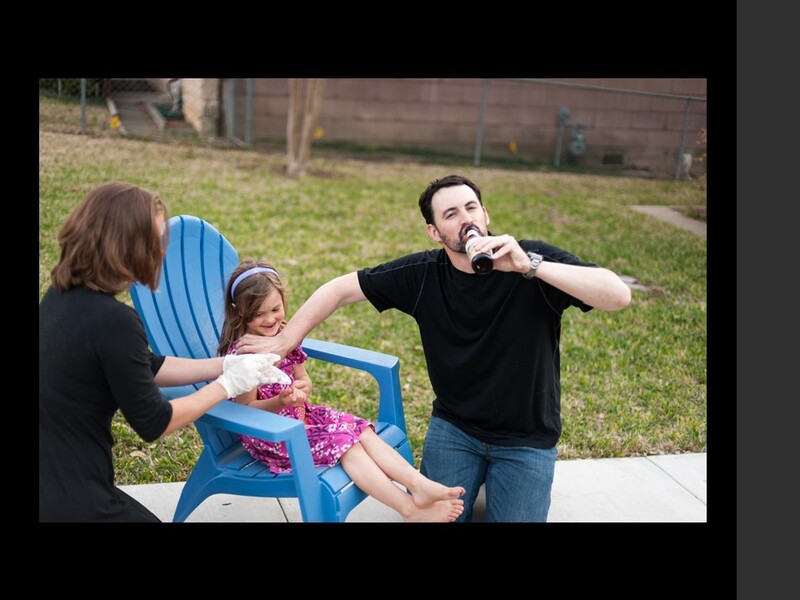 And here’s what happens if you let an amateur photoshoot take too long: the model gets the giggles and Dr. Daddy needs a beer. (For the record, the needle and beer are both simulated.) 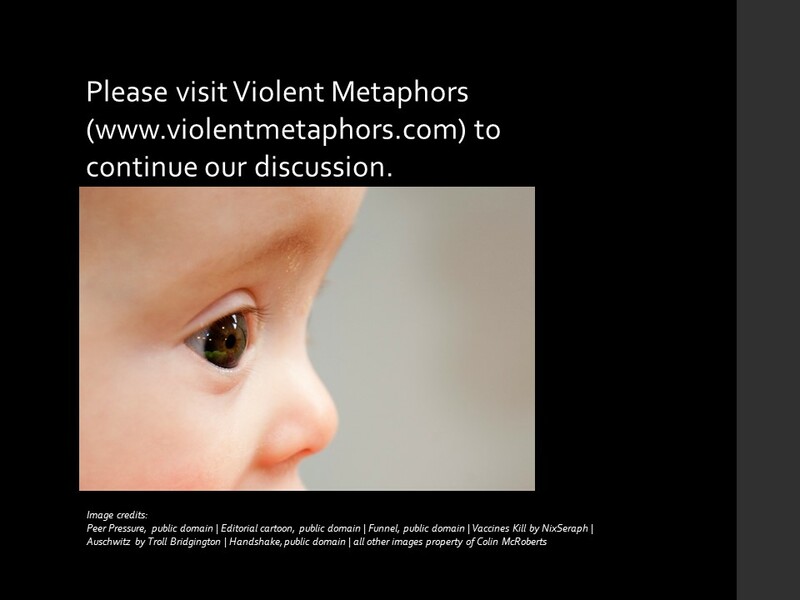 If I were trying to use my photography to persuade someone to vaccinate, and nothing else, I might actually use this image rather than the prior one. It has even more of that human element because it’s a little silly. No one in this image, not the patient or the (real) doctor, is worried about vaccines. That’s because vaccines are a safe and effective form of medicine, not some scary disgusting thing to be feared. Questions are a very important part of this process. Not rhetorical questions, necessarily, which are fun but almost never as effective as the questioner expects. Questions with an extremely obvious answer don’t have much persuasive value because they don’t provoke much thought or engagement, and people don’t change their mind on important issues unless they’re thinking and engaged. So for example, you can ask someone, “Don’t you want to protect your baby?” But what are they going to say? “Yes,” obviously, without coming any closer to your perspective on how to accomplish that. Better questions teach you more about the other side’s perspective. 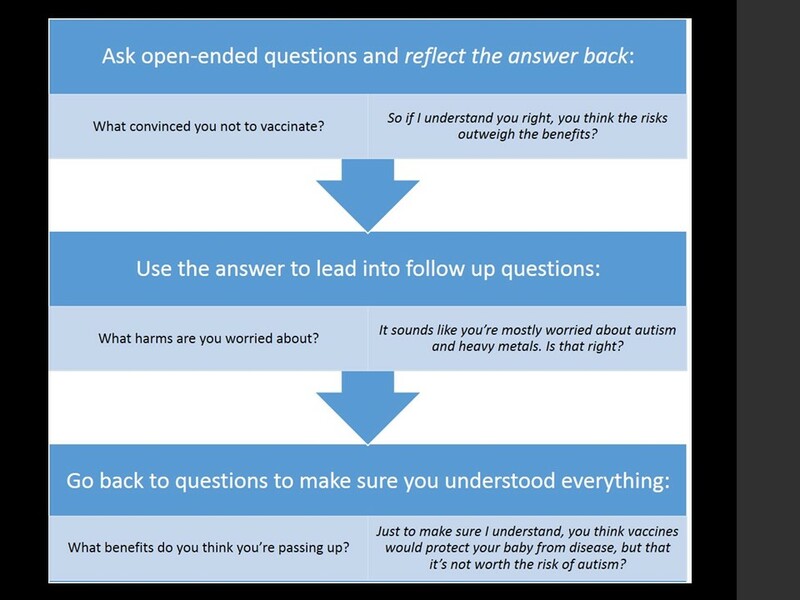 “What convinced you not to vaccinate?” “What harms are you worried about?” “What benefits do you think you’re giving up?” “What did your doctor tell you?” Questions like this establish a better in-the-moment relationship, giving you better communication and a better chance to persuade. Maybe more importantly, it breaks through the script in their head. Someone who’s expecting an argument but getting thoughtful questions can’t fall back on their expectations of how the conversation was going to go. They have to focus on what you’re saying instead, which helps both sides understand each other better. The best questions lead the other side to see your perspective. Remember that you are not changing someone’s mind for them. People are very resistant to that kind of change. Instead, you’re helping them change their own minds. They’re much more likely to come to that point on their own, with your help, than to be pushed into it. 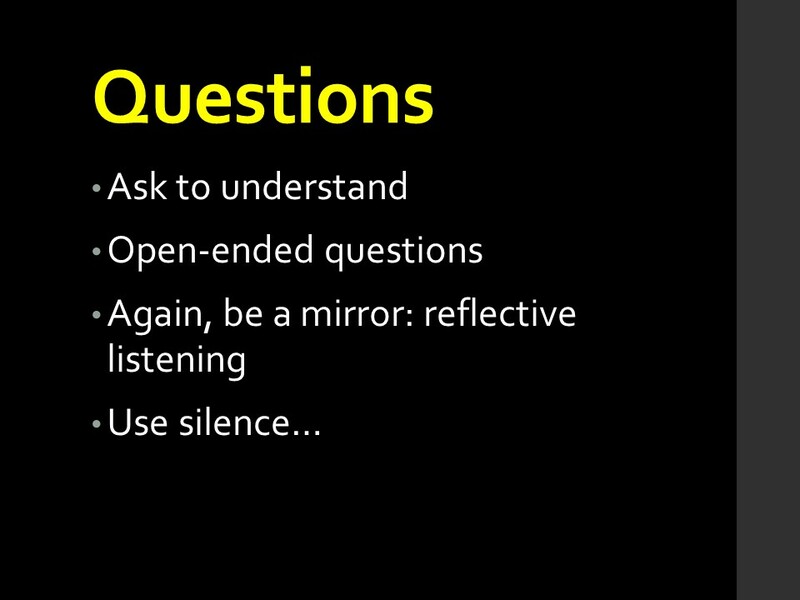 Careful questions can encourage that kind of thinking. But this requires a very robust conversation in which they’re willing to ask and answer questions. If you’re in a conversation that won’t support that kind of engagement, don’t force it. 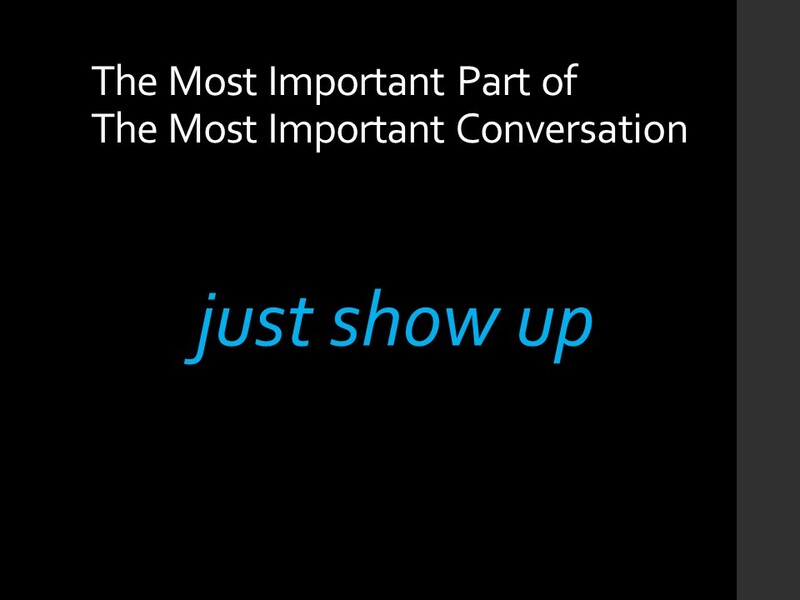 Remember that you’ve done most of what can be done, in most conversations, just by showing up. Don’t expect immediate results. It’s very rare for someone to say in the middle of a conversation, “You know, you’re right–now I see that I’ve been wrong all this time!” But if they seriously consider the conversation, they might find parts of it that support changing their own mind later. A lot of the persuasion in a conversation like this actually happens after the conversation is over, when a person reflects on what they just talked about. People want good information about vaccines, although some more than others. One doctor at the Summit talked about research showing that pregnant women particularly wanted details. Giving them good information is a great way to help them break the expectations created by anti-vax peers. Remember, though, that winning the debate is not the point. You’re giving them a place to stand in changing their mind, not changing it for them. That means that a knock-down drag-out argument over what a particular piece of research means probably won’t accomplish much. There’s one possible exception, though. Remember that a lot of people will get their beliefs about vaccines from what they overhear and read online. If you read some bit of urban legend or nonsense anti-vax talking point, do feel free to correct it. 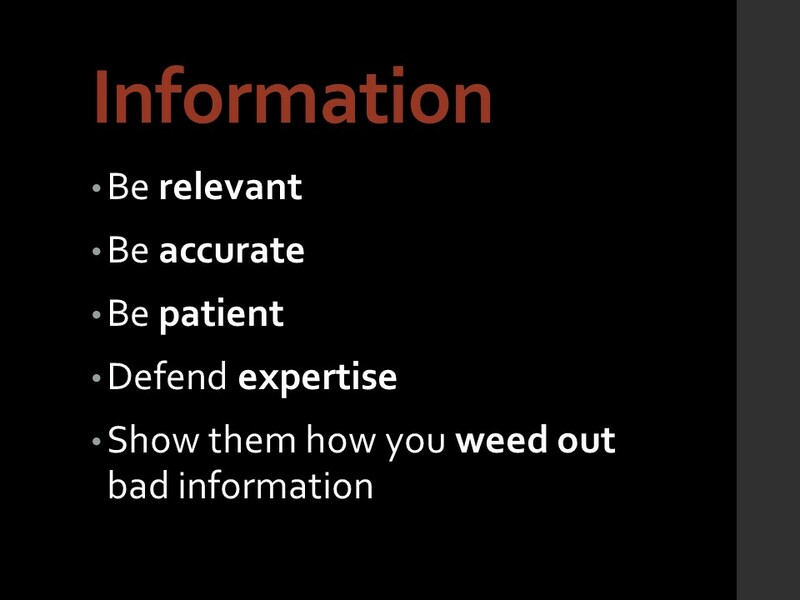 It’s ineffective to take someone you’re trying to persuade and argue details with them; it’s much more effective if you help them avoid bad information in the first place by addressing it when you see it. Don’t give an information dump. Stick with what you can talk about credibly, and what they care about. Telling someone that vaccines don’t have mercury anymore is a waste of time if they’re actually afraid of aluminum. Finally, focus on the process rather than individual facts. This means helping the other person discriminate between good and bad information, to reduce their vulnerability to anti-vax scaremongering. For example, you might ask a vaccine-hesitant parent, “There’s a lot of good and bad information out there. It’s so important to separate the two. How do you tell the difference?” Notice how phrasing this as a question both helps you understand their perspective and promotes greater engagement, while encouraging them to see the distinction you’re making. There is no silver bullet. No single piece of information is going to persuade anti-vax troopers that their cherished beliefs are wrong. Nor can you refute every piece of misinformation you come across. Instead of trying, and hurting the relationship with a belligerent approach, remember that your goal is to help the other person cultivate better sources of information. These sources are particularly good. They will help arm vaccine-hesitant parents with anecdotal, scientific, and clinical evidence to support a change of mind. 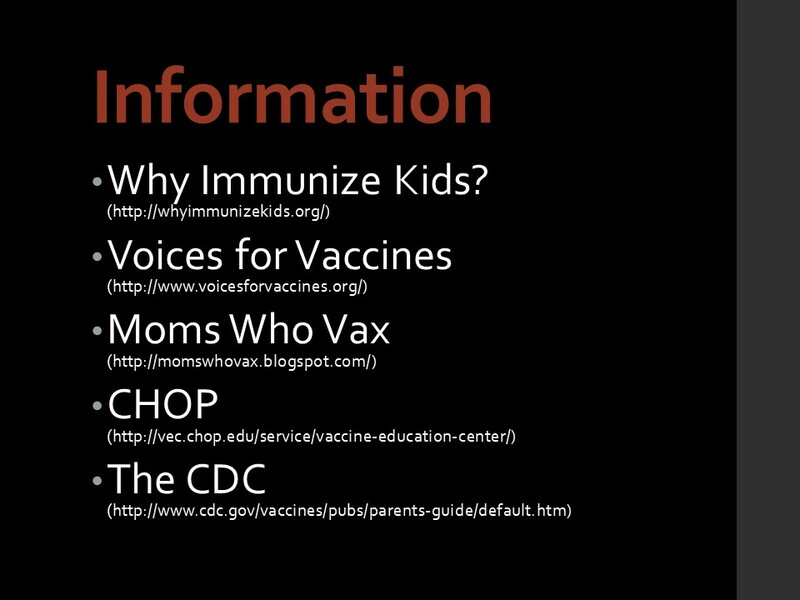 Some people will reject one source of information or anther for extraneous reasons (“I heard the vaccine guy at CHOP eats puppies for breakfast, why would I listen to him?”) so it’s worth providing multiple sources of information. This is planting seeds that may grow into a long-term attitude change, so plant as many seeds as you can. I think the best information is probably that which comes from a source that feels sympathetic to the other person. That’s why I particularly like Voices for Vaccines and Moms Who Vax, for providing personal anecdotes and messages from parents in support of immunization. It’s great to back up those very persuasive, personal messages with information-dense sources like Why Immunize Kids and the CDC. Finally, you have to be realistic about these things. 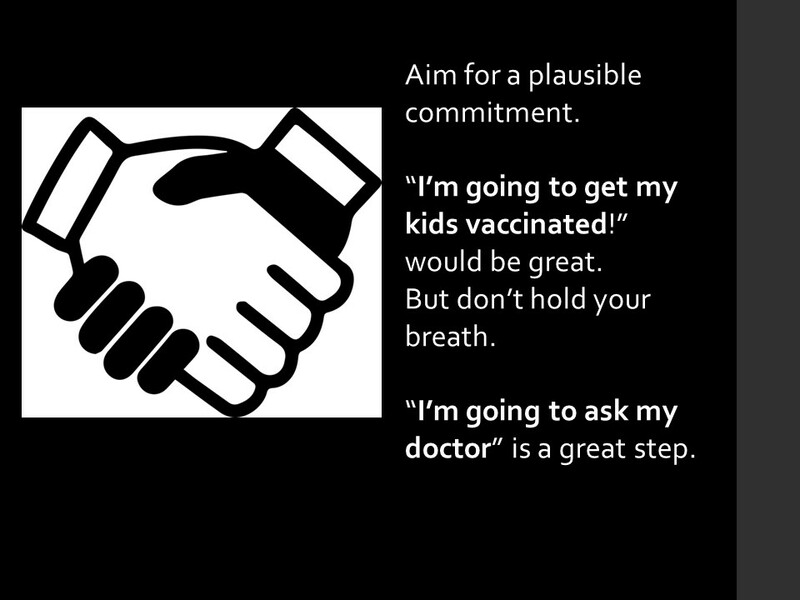 No one is going to persuade a committed, invested, hard-core anti-vaxer to change her mind on the spot. Shoot for realistic commitments, because they drive future change. Obviously this somewhat hasty explanation isn’t the end of the story. Now that you’re here, join the conversation and tell us what you think about these conversations and the tactics we’re suggesting. I think you raise some important issues here. 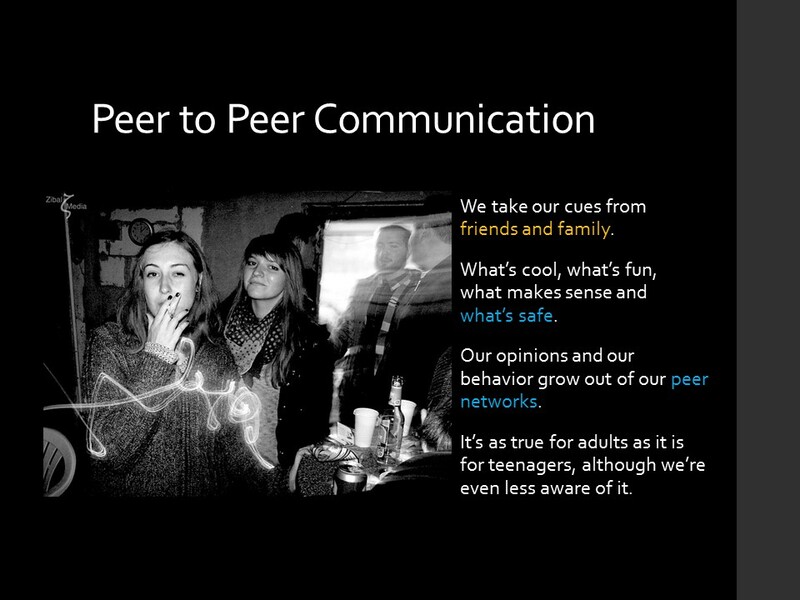 The peer conversation is a good approach. I think we forget how much of an influence those we consider our peers have over us for better or worse. Thanks for the interesting post! It was an excellent presentation, and I feel I learned much. Thank you very much.